Irrigation and sprinkler systems are vital elements of a property’s health, especially in southeastern Texas. However, they’re also frequently overlooked. After all, once these systems have been installed, it’s easy to forget about them as they’re mostly out of site. Problems with your irrigation or sprinkler system can lead to a wide variety of other problems. If your system isn’t performing properly, you may notice spots of dead grass, excessively muddy areas, or dying plants, among others. So if you’re interested in installing an irrigation/sprinkler system or you think your system could benefit from repairs or maintenance, give us a call. 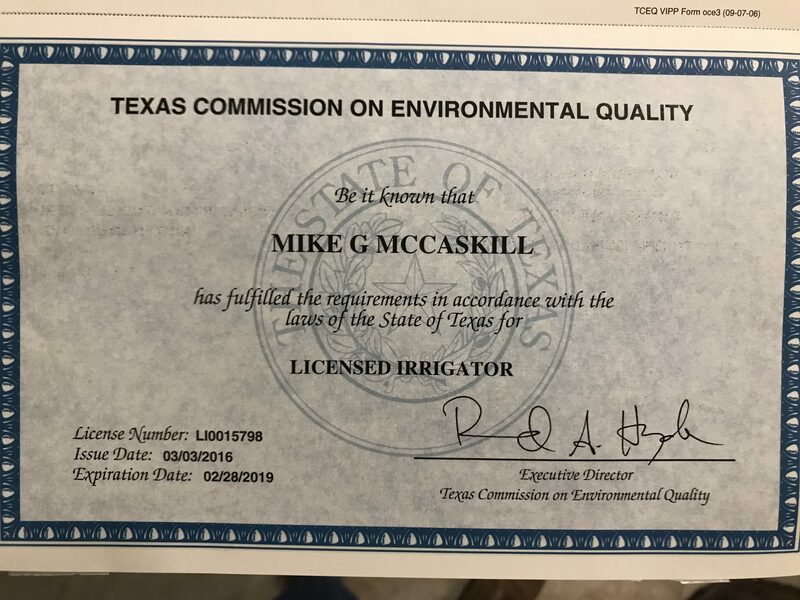 Our licensed irrigators will be able to help you find the right system for your needs or they’ll be able to pinpoint and fix any problems you may be having. Unless you’re an irrigation specialist, it’s difficult to know which irrigation or sprinkler system will be the best for your needs. Not only are there a lot of different types of systems, but each property has its own unique irrigation needs. That’s where we come in. Whether you need a new system installed or you need to get your current system replaced, our experts will help you find exactly what you need. We’ll give you a clear run down of your irrigation/sprinkler options and our recommendations so that you have a clear understanding of your choices. We’ll also provide a straightforward estimate that breaks down the costs of parts and labor so there’s no need to worry about any surprises throughout the installation process. If it seems like your irrigation/sprinkler system isn’t working as it should, our licensed irrigators will come out and identify the issue. Once we’ve pinpointed exactly what’s going wrong, we’ll let you know all the details and we’ll give you our recommendations for repairs. As we’ve been working with sprinkler and irrigation systems for years, we know that most people don’t have the same in-depth knowledge as we do. That’s why we always make sure our customers have a good understanding of what’s going on and that they’re kept in the loop every step of the way. Regular sprinkler/irrigation system maintenance is key in keeping those systems performing at their best. Whether we’ve installed your system or not, we’ll determine what maintenance items will be ideal for your needs. In addition to yearly flushing/winterizing, we may recommend other services designed to maximize the life of your system. Our professionals will give you a plan that details all the maintenance items that will best suit your system along with a schedule that identifies when these items should be completed. Once we have your okay, we’ll get your maintenance plan underway and begin the regular maintenance series. Do you have questions about your current irrigation/sprinkler system? Give us a call at (713) 984-4773. Our licensed irrigators can come out to your property and help you determine what your best options are, from new systems and upgrades to repairs and regular maintenance schedules.